Millions of Americans got a raise today. I am grateful to not be one of them. I’ve worked for minimum wage. 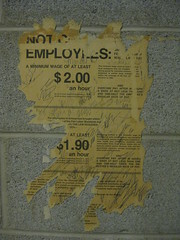 During and just after college, I waited tables in Texas where ‘tipped employees’ were paid just $2.13 an hour. That number hasn’t changed at all in the last twenty years, and guess what? Today’s federal wage increase doesn’t apply to them, so servers in 24 states are still making under $3 an hour. And what you may not know, if you’ve never worked in a restaurant, is that waitstaff are required to do an hour or more of ‘sidework’ before and after each serving shift, for which they are still only paid $2.13. The tips you get (or don’t) during the few hours you’re actually waiting tables have to make up for the hours you spent mopping floors, filling condiments, and rolling silverware into napkins. And there are no guaranteed hours — if the restaurant isn’t busy enough, you’re told to do your sidework and go home, tipless. Add on some cut-throat restaurant politics and … there were plenty of days when I didn’t average the bare $4.25 per hour. That sucked in 1993. Cost of living is 150% more expensive now. I don’t know how people stand it. Best place to work in a restaurant? Right here in Washington State. Washington has long had the best minimum wage in the country (currently $8.07, indexed to inflation every January). And we’re one of just seven states that requires tipped employees to be paid the full minimum wage. California and Oregon are also good choices, at $8 and $7.95 respectively. West Coast, baby. Earlier this week I watched the first episode of “30 Days,” in which Morgan Spurlock (of Super-Size Me) and his girlfriend Alex live for a month on minimum wage. It’s a stunt, yes, but it’s a poignant stunt with a lot of truth to it, and if you’re making more than $10 per hour right now you should go and watch it. Really. I was nearly in tears when it was over. It’s so hard, and so unfair. And as he said at the end … they were two educated articulate white people without kids. So many people have it so much worse. For me it was a good reminder that, as often as I am unhappy about some aspect of my job, there’s a whole league of problems that I have left behind, and another that I mercifully have never had.